Don’t be alarmed by feelings of déjà vu. 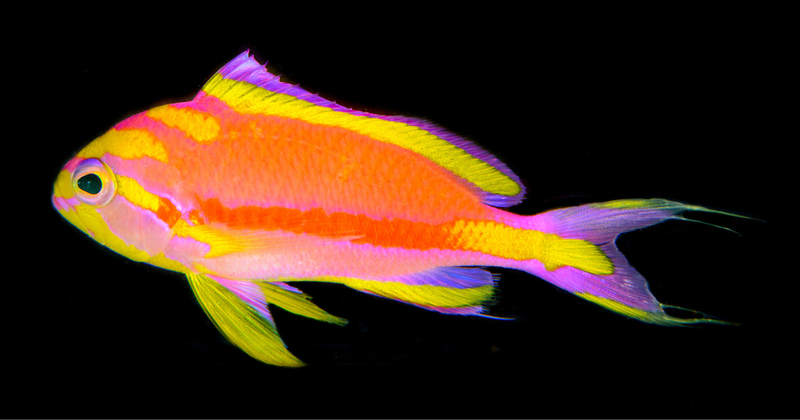 Just last week we shared the story of the newly-described Tosanoides aphrodite in the Atlantic Ocean, and on the heels of that revelation comes the species description of a fifth member of the deepwater anthias genus Tosanoides. Published in the journal ZooKeys, the open-access article by Richard L. Pyle, Brian D. Greene, Joshua M. Copus, and John E. Randall formally describes Tosanoides annepatrice, a new basslet from deep coral reefs in Micronesia (Perciformes, Percoidei, Serranidae). A new species “described” is often not a new species “discovered.” This new fish first became known to scientists 11 years ago. The initial specimen was collected by Brian D. Greene in 2007 “at depth of 115 m [377 feet] off Ngaruangl Atoll, Kayangel State, Republic of Palau,” a feat capable only with the use of mixed-gas closed-circuit rebreather diving. But one fish is not necessarily enough for a species description, so scientists patiently waited until 2016, at which point Greene was able to collect “one large adult male and two juvenile specimens” on the mesophotic reefs of Pohnpei, Federated States of Micronesia, at an even greater depth of 148 m [485 feet]. Now, with four specimens collected, a proper analysis could be conducted, which resulted in the species’ description. Tosanoides annepatrice received its name in honor of Greene’s mother, Anne Patrice Greene, who is credited with fostering and encouraging Brian’s deep diving exploration on the reefs of Micronesia. This is Anne Patrice’s Anthias—pretty hard to top such an honor for a birthday or Mother’s Day! With adult male holotype and paratype both measuring in at under 3 inches standard length, and immature female paratypes measuring just over 1 inch, this is a decidedly small Anthias species. It’s unlikely you’ll encounter this species in the aquarium trade, but if you did, expect that its price tag would be stratospheric, owing to the difficulties surrounding its collection. You’d also face the difficulties associated with bringing deepwater fish to the surface and their unique needs in an aquarium setting. The authors report that these fish are generally observed “along steep limestone coral-reef drop-offs at depths from 115–150 m. The paratypes were collected along a small rocky crevice near the entrance to a cave, but other individuals have been seen in similar habitats not in association with caves. Most individuals of this species have been observed in groups consisting of one apparent male and several apparent females and juveniles.” This information suggests that dimly-lit aquariums with appropriate rockwork and likely cooler temperatures would be necessary for the successful long-term husbandry of the species. However, even if there was any hope of seeing a fish like this in the aquarium trade with any sort of regularity, it is more plausible that a small handful of specimens could be collected and established in a marine fish breeding operation. From there, captive-breeding could produce this fish in quantity for limited distribution if demand would support the effort. If you’ve enjoyed the two new Tosanoides, just wait. The paper noted that there likely two more new species already known to scientists, potentially awaiting their own debut. 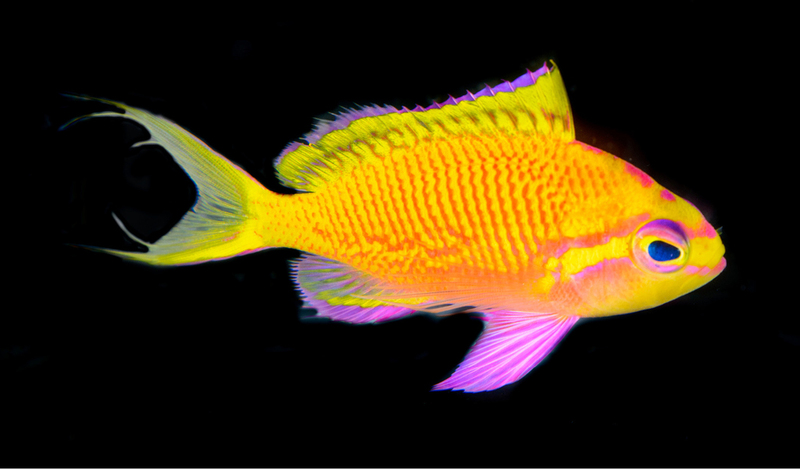 Be sure to read the full open-access ZooKeys article for more information on this beautiful new Anthias.